Please return your item(s) to us along with a completed returns form within 28 days of delivery. You may also return items to all UK stores. Please ensure items are in their original condition. For more information, please see our returns policy. Due to hygiene reasons, we are unable to offer an exchange or refund on underwear/swimwear/cosmetics, unless they are sealed in their original packaging. This does not affect your statutory rights. Whatsapp will now open if it is installed on your device. 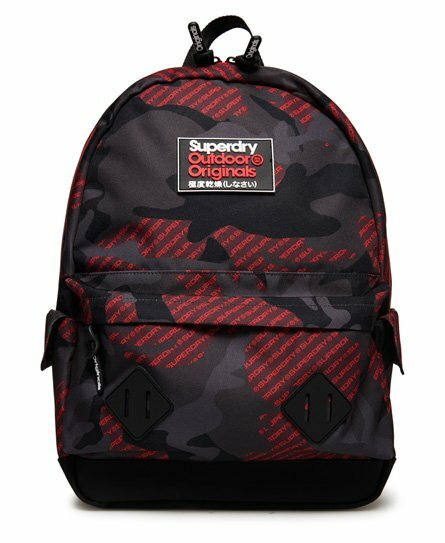 Superdry men's logo all over print Montana rucksack. This staple rucksack features a top grab handle, adjustable shoulder straps and a padded back for your comfort. This Montana also features a large main compartment, smaller front compartment with a zip fastening and twin pockets with popper fastening. The rucksack is completed with branded zip pulls and logo badges on the front and shoulder strap. 21 litre approximate main compartment capacity. Please note: Due to hygiene reasons, we are unable to offer an exchange or refund on underwear/swimwear/cosmetics, unless they are sealed in their original packaging. This does not affect your statutory rights. Updating your delivery country may remove any existing products in your bags and invalidate certain location-specific promotions.